« Pravasi Bhartiya Diwas & Khadi Exhibition – India Culture Center @ Budapest – 2019. Hungarian Heritage House – Kallós Zoltán – exhibition hall. Fifteen Mohács “Buso’s” and the Poklade band also participating. 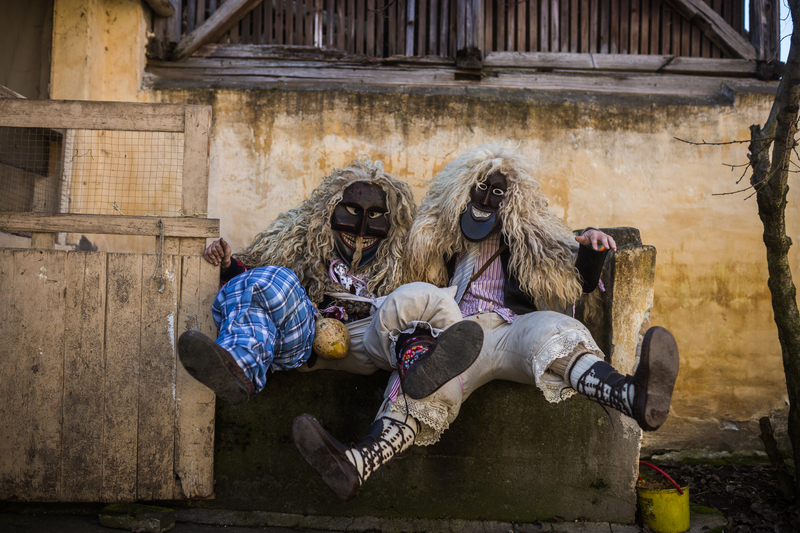 The exhibition is showcasing the revolutionary tradition of the „Buso walks” … in other words … „Masked Monster Carnival” celebration that is taking place each at the city of Mohács. It is also recognized by UNESCO as an intellectual cultural heritage. The history of the “Buso walk” in Mohács has undergone various changes, but in its renewed formation it has survived to this day and has been renewed its form. First of all … the traditional Carnival, brings back celebrating drunkenness and revelry the week before Lent begins on Ash Wednesday. Secondly, it’s the reenactment of a historic victory by the Šokci, a Croatian ethnic minority that has a large populous in Mohács. As the story goes … „”Buso walks”is a national tradition dating back to the early Middle Ages. The townspeople fled the city to escape the Ottoman Turks who had invaded in 1526. Hiding in the forest, they were approached by an old mystic who told them to don masks, weapons, and bells, and that a night would appear to lead them into battle. Some nights later, when the masks were fashioned, the knight arrived and led them home to Mohács where the racket of bells led the Turks to believe they were plagued by demons. They deserted the town, and the locals had their homes back. Another, more ancient version tells that by the “Buso walks” are chasing away winter itself. At the “Buso walks” are participants dressed in woolly cloaks and head coverings, wearing grotesque wooden masks, baggy trousers and leather moccasins; their identity is hidden, allowing them to engage in mischievous, good-natured pranks. They attempt to frighten away winter with a number of noisy devices: sheep’s bells, rattles during the”Buso walks” with horns and even cannons. These masks can be viewed especially by foreigners and tourist staying in Budapest for the time being, to take some more memories back home from their stay in Budapest. Visiting the exhibition free of charge. Opening hours: Monday–Friday: 10 a.m. – 6 p.m. or until the end of exhibition. "Son Of Saul" - Hungarian film - on the list for BIFA!